I am sure that my officemates are growing tired of getting unsolicited updates on Honeybee. 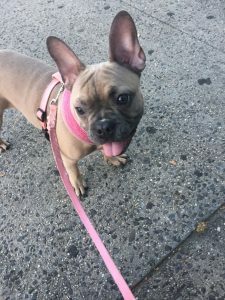 You see, Honeybee is my year old French Bulldog that I had to, at least temporarily leave behind in New York City when I relocated to Albany, New York last December. Our separation has not been an easy one as she is part of the reason that I was able to make the decision to move. Our backstory is a complex as most intimate relationships are. Following extensive hand surgery last year, I was unable to do the simplest things that I had long taken for granted. I could not shower myself, comb my hair (okay, my natural style lets me occasionally get away with long periods of not combing it), cook, or dress myself. Anything requiring the use of both hands was impossible to do. I moved in with my youngest sister to get help with these routine tasks and to also have some emotional support for what continues to be a long and physically painful healing and rehabilitation process. My sister was fostering a brood of four Frenchies and the lone female remained as each of her brothers left the nest. She was a big and broad puppy, prone to loud snoring and frequent bouts of uncontrolled flatulence. Her head looked like it belonged on an adult dog and her scowl was one for the ages. My sister went back to work after getting me settled in. 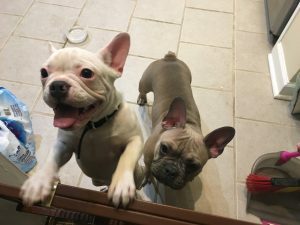 It was just me and the Frenchie for 8 or more hours a day. After cautiously sizing each other up, we made peace with each other. She accompanied me outside each morning to read my bible and have my morning cup of coffee. After about 2 weeks, I noticed that we had not really given her a proper name. For some reason the color of her coat reminded me of honey, and her shape reminded me of a honeybee. So, I named her Honeybee. After a few more weeks, we settled in to a routine. We shared avocado toast while watching old movies on Turner Classic Movies. She laid in my lap patiently as we watched old Bette Davis and Elizabeth Taylor movies. She watched me with confusion and great attention as I did my hand exercises. We took a late afternoon nap together. She listened to my prayers and I listened to her snorts. After 2 months, I returned to work and worked from home. She made a relatively smooth adjustment to not being the center of my attention for a solid 7 or 8 hours of each working day. Honeybee patiently slept to the dozens of calls I sometimes had each day, and she was careful to get out of the way of my webcam during video conferences. Every now and then she interrupted a conversation with a loud series of farts and snorts but we both pretended like nothing happened. Me and my dog spent countless hours trying to decide whether a move to Albany would be a good one for the both of us. I guess at some point in time, I got tired talking to her about it and she got tired listening to me talk about it. We both reached the same decision: just do it. So I moved to Albany with the intent of having Honeybee join me once I got settled. But the best laid plans often do change. Honeybee has a younger sister, Sweet Pea, that my sister began fostering. During holiday visits with my family, I could not ignore their real affection for each other and dependence on each other. It was going to be traumatic for the both of them when Honeybee moved to Albany. When I went down to the city to pick her up 2 weeks ago, I realized that I could not separate Honeybee from Sweet Pea. Just couldn’t justify it. So, Honeybee’s arrival has been delayed. I don’t have a fixed deadline or anything; I’m just going with the flow. But I still needed some companionship at home. 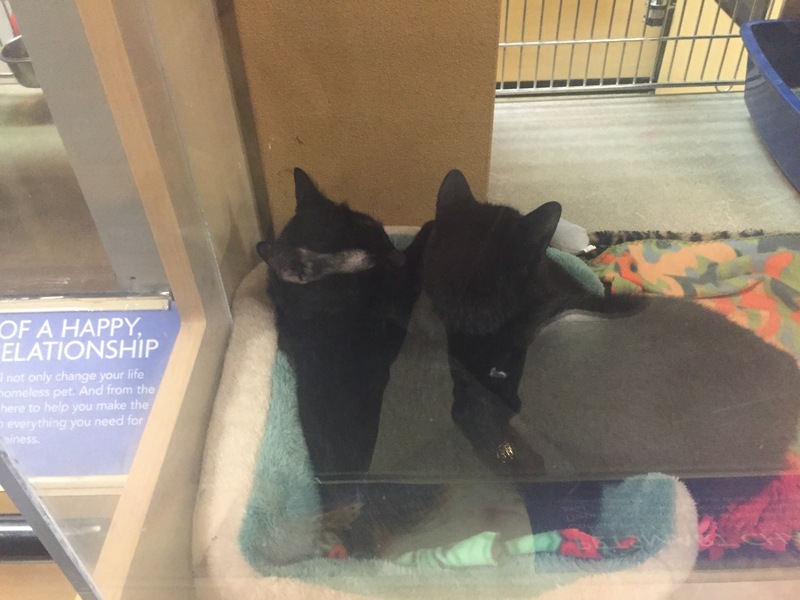 Last week I adopted Jack and Wally; two adult black cats who were abandoned in an apartment. Unfortunately, I have not seen much of them as they hide under the bed checking their new digs out. I am looking forward to them becoming more settled. I am sure that we’ll bond soon; but I am certain that it will not be over avocado toast and a movie.